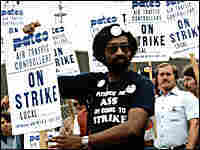 1981 Strike Leaves Legacy for American Workers The air-traffic controller's strike 25 years ago left many of the strikers jobless and unable to return to the FAA after President Reagan banned them. The tension of that era affects workers today. Timeline: Scroll down to read a history of the strike. Twenty-five years ago, on Aug. 3, 1981, more than 12,000 members of the Professional Air Traffic Controllers Organization walked off the job, setting off a chain of events that would redefine labor relations in America. 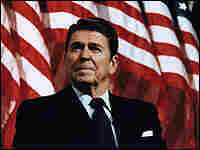 In response to the walkout, President Ronald Reagan issued one of the defining statements of his presidency. He said the striking air-traffic controllers were in violation of the law; if they did not report to work within 48 hours, their jobs would be terminated. Reagan carried out his threat. Today, tensions are once again high between the Federal Aviation Administration and the union that eventually emerged to replace PATCO, the National Air Traffic Controllers Association. NATCA and the FAA cannot agree on a new contract, so the FAA plans to impose its own contract, which includes major wage concessions. Ruth Marlin, executive vice president of NATCA, says these concessions will make it harder for air-traffic controllers to do their job. "Experienced controllers who transfer to busier facilities would take a large pay cut to do it," Marlin says. "So what we'll see is new hires going into very busy airports — Dallas, Fort Worth, Atlanta, Chicago. We've never trained new hires at places like that." New hires would be paid far less than they are today, she says. "This proposal is not simply a, 'We want to roll back the gains that were made in the last contract,'" she says. "It is deprofessionalizing air-traffic control." FAA spokesman Jeff Basey says his agency is starved for cash. Under the last contract, the annual cost of paying air-traffic controllers has climbed by $1 billion. He says the union is walking away from a contract that not only protects salaries but will also raise them through performance-based measures. According to the union, salaries average a little more than $100,000, plus benefits. When PATCO went on strike in 1981, Ken Moffet was the chief federal mediator. He says the union wanted a shorter work week and higher pay. Moffet says the strikers believed if they were gone, the safety of the flying public would be at risk. But that wasn't entirely the case. Moffet calls the strike a "calamity," not just for the fired air-traffic controllers, but for unions everywhere. Back in 1981, labor negotiations centered around the size of workers' raises. Subsequently, management began going after all unions for concessions and laying people off, he says. Georgetown University historian Joseph McCartin is writing a book about the PATCO strike. Prior to PATCO, it was not acceptable for employers to replace workers on strike, even though the law gave employers the right to do so, he says. The PATCO strike eased those inhibitions. Major strikes plummeted from an average of 300 each year in the decades before to fewer than 30 today. "Any kind of worker, it seemed, was vulnerable to replacement if they went out on strike, and the psychological impact of that, I think, was huge," McCartin says. "The loss of the strike as a weapon for American workers has some rather profound, long-range consequences." Dwayne A. Threadford, a striking air-traffic controller, wears a provocative T-shirt while picketing the FAA, Aug. 4, 1981. Assistant Attorney General Rudy Giuliani defends the Reagan administration's actions. 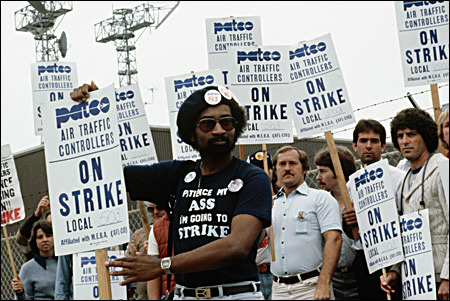 Aug. 3, 1981: About 13,000 PATCO members go on strike after unsuccessful contract negotiations. In doing so, the union technically violates a 1955 law that bans strikes by government unions. (Several government unions had previously declared strikes without penalties.) 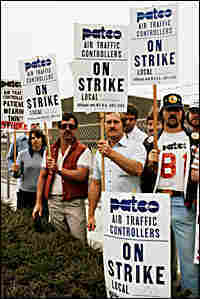 President Ronald Reagan declares the PATCO strike a "peril to national safety" and orders the controllers back to work. Oct. 3, 1996: Congress passes the Federal Aviation Reauthorization Act, which codifies NATCA's ability to bargain collectively with the FAA for wages and personnel matters.